Preeti Chaturvedi is a senior marketing professional and writes on media and cultural studies. She has co-authored India's first book on blogging, Corporate Blogging in India (2009). Preeti's blog 'Checkposts' features amongst the leading marketing blogs in the country. 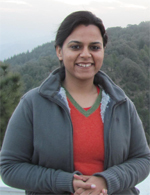 Preeti has contributed to global research on branding and has published papers with Brandchannel.com and World Advertising Research Center. She has also written extensively on media, marketing and cultural studies for the ICFAI Press, Indian Council for Cultural Relations, Moneycontrol.com, Business and Economy. A Delhi University topper in English Literature from Miranda House with an Executive Diploma in Sales and Marketing from the Indian Institute of Management (IIM), Calcutta, she has also been a guest faculty/speaker at leading institutes like the IIT and Fore School of Management. She has a decade of experience in marketing communications during which she has handled some of the leading global brands.